State-run Channel 1 television's main evening newscast opened Sunday with an item that portrayed the IDF's vaunted haredi battalion (Nahal Haredi or Netzach Yehuda) as an politically extremist unit, following three incidents involving the unit's soldiers, who are currently serving in the Binyamin region. 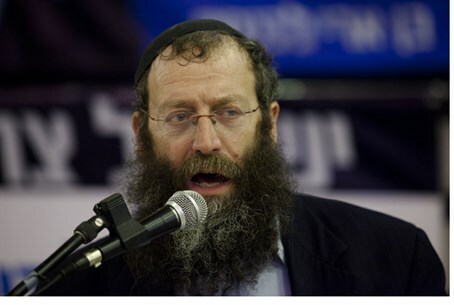 Marzel, a resident of Hevron and follower of Rabbi Meir Kahane, was a Knesset candidate for Otzma Yehudit, which ran in a joint list with Eli Yishai's Yachad - Ha'am Itanu but failed to get enough votes to enter the legislature. Another incident involving the unit was an altercation with an Arab rioter near Jilazoun, who approached soldiers, provoked them, waved his fist at them and grasped at one of the soldiers' guns. The soldiers were court martialled for alleged excessive use of force and two of them received suspended jail sentences. A third incident involved a vehicle that overturned Sunday, crushing a terrorist to death beneath it. Channel 1 saw fit to cite Arab sources who alleged that even this event was the fault of the IDF. The unnamed Arabs said that the soldiers had shot the terrorist to death before the vehicle overturned and alleged that the accident was somehow intentional. The Nahal Haredi is a thorn in the side of leftists who fear that the IDF is becoming too religious and resent the fact that the unit does not want female commanders or instructors. The Left's flagship project in the IDF in the last two decades has been the integration of women into combat units. However, while inserting women into combat units involves lowering the standards of acceptance for the units, the haredi unit has acquired a reputation as a topnotch unit that achieves excellent results in the field and has received multiple awards.